I can’t run for a week and it is killing me! Last Wednesday I underwent LASIK eye surgery and I am not allowed to get sweat in my eyes for a week while my eyes are healing. This will be the longest that I have gone without running since I started, but it will all be worth it in the end. As long as I can remember I have not been able to see as well as I would have liked and it has been getting worse and worse as time goes by. I could barely see out of my right eye and my once good left eye has been declining as well. The thought of LASIK surgery had crossed my mind, but I was always scared at the thought of anything going near my eyes. I couldn’t even have someone put drops in without a struggle! At the last Track Shack race I worked at, a representative from Hunter Vision noticed the trouble I was having with my glasses in the heat and humidity and tracked me down to tell me about LASIK surgery and he set me up with a free consultation. I didn’t think it would lead to anything, but it was free so I decided to go and hear what they had to say. It turned out that I was a candidate for the procedure and I honestly started thinking that it could become a possibility. After a lot of research and discussions with my family I decided to go for it. The surgery went great! It was one of the weirdest experiences ever, but totally painless and easy! It has now been a week since then and I couldn’t be happier! For the first time ever I can see clearly and I never have to bother with glasses again. I keep thinking about all the things I will be able to see now and how great running will be with my new vision. It seems like small things but I will now be able to see the starting line stage at Disney races or finish line clocks as I approach. I never run with my glasses on, so I know that there is so much that I am missing on my runs. I will be able to see the world in a new way and I can’t wait! Working at the Star Wars Dark Side 10k and Expo Fun! I took a week off from Canada to fly home for the Star Wars Dark Side weekend. I was worried about how I would do during the half that Sunday because my training wasn’t one of my best. I don’t think that there was one week where I ran every day that I was supposed to. Work had been taking up most of my time up here, so when my alarm would go off early each morning, I would sometimes hit the snooze and lay my head back down. Another problem was the weather: I had been training in freezing conditions and Florida was anything but freezing during April. I flew back to Florida late Friday night. I already knew that it was unlikely that I would get anything from the Expo because the merchandise usually sells out the first day. I tried to sleep some on the plane, but that is really hard when there is a screaming kid a couple rows back. I went to bed shortly after I arrived home (after I spent some time with the kittens!) because I had the brilliant idea of signing up to work the 10k with Track Shack the next morning. At least it prepared me for getting up early for the half! After quite a few first finishers crossed we were moved to our posts that we would stay at for the remainder of the race. My job was to make sure no one went back the wrong way up the finishing chute. Most people listened, some argued. I’m not sure why people feel the need to wait for people in the chute itself. That’s what the family reunion area is for. Also finishing photos are not group photos. It is supposed to be you with your medal. Coming back up the chute with friends to take a group photo is not allowed and really makes no sense. There were about six backdrops with characters in the family reunion area where group photos could be taken. It was our job to clear the chute as soon as possible to get the runners on their way. Since I was very lacking in sleep I couldn’t wait until my shift was over so I could rest up for the half. After everyone had been cleared out of the finishing chute and the two missing kids had been found, I was allowed to leave. I headed home to get ready to head right back there for the expo since I still had to pick up my packet. I was really disappointed with the expo. I usually am able to go the first day and get what I want. We first went up to the pre-order area after I got my bib and the official merchandise area that was up there was closed and completely empty. I went to the pre-order pick up area to ask if they had extra jackets. I saw the design when someone posted it online and really wanted one. After I got my Princess one I really regretted not ordering the inaugural Dark Side one. I was told that extras would be sold at the merchandise tent after the race. I hoped that my family would be able check for one before I finished the race. We left that building and made our way to the main expo building. As expected when we entered the official merchandise area almost everything was gone. There wasn’t anything that I needed, I just would have liked the a tank if they had one. They didn’t, so I ended up getting a yellow performance shirt with Vader and storm troopers on it. After I paid for the shirt we were able to relax and walk around the expo. I had a list of a couple booths that I wanted to check out. I talked to photo pass to inquire about a single day memory maker since I was only doing one race. I was told it was $69. A little more than I wanted, but still cheaper than Marathonfoto! I looked for the Luna Bar booth and the Cliff Bar pacers, but couldn’t find either one. I didn’t even see pacers at the half. I was really bummed by the Luna bars not being there because it was one of my favorite booths at the expos and I was getting hungry. The last thing I wanted to check out was the Sparkle Skirts booth. I had been hearing for a while how great they were, but I couldn’t justify the high price tag and high shipping price. I wanted to see one in person to figure out why they were loved so much. When we got to the booth there was a sale rack right up front. I looked though a bit and found a very pretty and sparkly one for only $55! They are usually all about $70. There were some curtains to the side where people were trying on their skirts. Chris convinced me to try it on, so off I went. As soon as I put it on I couldn’t believe how comfortable it was! I jogged in place for a bit in the dressing room and it felt great! I stepped out to talk to the owner and she made sure that I had picked the right size. It was a perfect match so I bought it! I had finally fallen to the power of the Sparkle Skirt. There wasn’t really much more to look at and I was exhausted, so we left to get lunch. After I ate I just rested and then went to bed really early. I wanted to be the best I could for the half the next day. I was really nervous, but all I could do was my best and trust in my training. After Star Wars Half Marathon:The Dark Side last weekend I contemplated which runDisney half I should run during 2017. I had thought that it would be Star Wars because I wanted to try to get legacy, but after running it I am having second thoughts. I will elaborate more on why that is during my Dark Side race recap. It just so happened that the Tuesday after the Half was early registration for the Walt Disney World Marathon Weekend. I plan on running the marathon as my first marathon in 2018 for its 25th anniversary, but the half seemed very tempting. I have never run a race during marathon weekend and I thought it might be good to run the half the year before I take on the full. Also it is the half’s 20th anniversary and those always make for great medals! After considering all of that I signed up for the half. The process was very quick and easy and I was finally able to use my new proof of time from this year’s Princess Enchanted 10k. I know I won’t be in as high of a corral as at Princess during this race, but I think my proof of time will give me a decent, competitive corral that I can try to set a PR in. I can’t wait and I know it will be a lot of fun! I have had quite a few running adventures since I have been here. 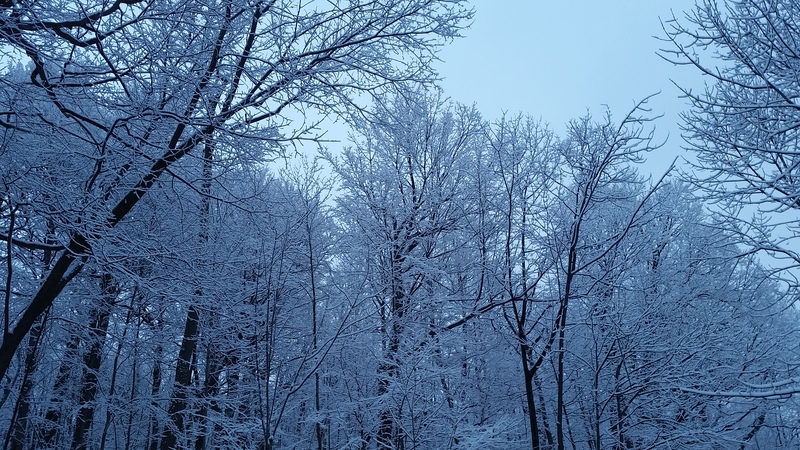 One morning before work I ran ten miles up and down Mount Royal in the snow. I found a nice long trail once I was near the top and I couldn’t believe how beautiful it was! 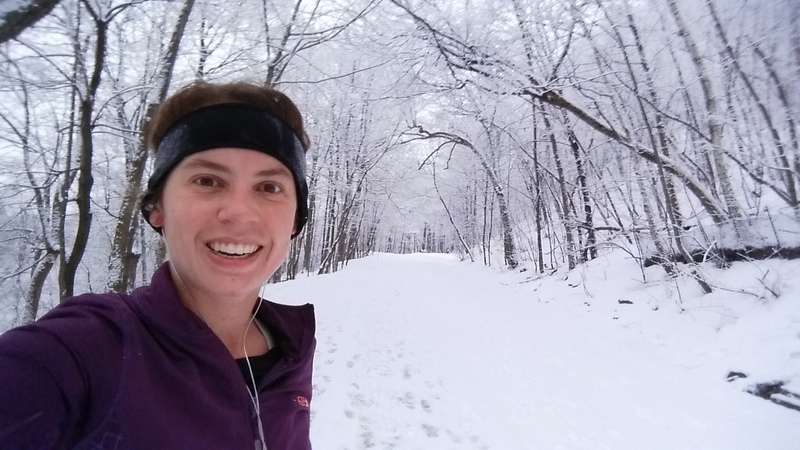 It was my very own winter wonderland and probably one of my favorite training runs to date. It was so peaceful there and I had to keep stopping to take photos even though I will remember it forever. 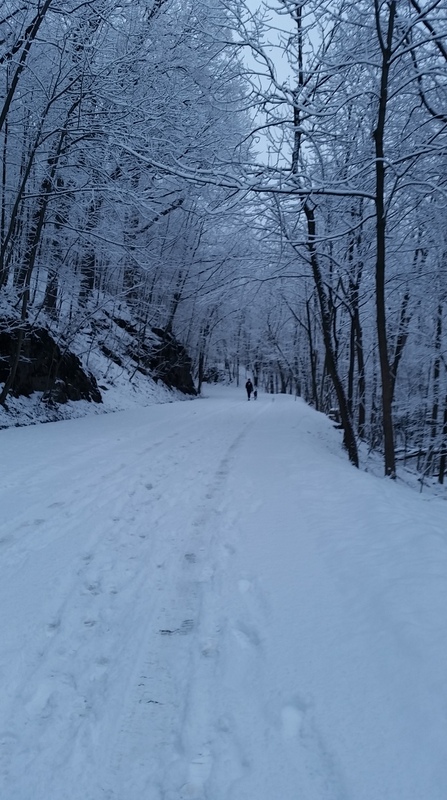 Running up Mount Royal has been very challenging. There are so many hills in Montreal and I feel that has made me a better runner. I am ready for The Dark Side Half and am really looking forward to it despite the heat in Florida. I will also be working at the 10k the day before so say hi if you see me! It should be fun and I am looking forward to a relaxing week off back at home. Compression Socks and sleeves have helped me a great deal in my running. I usually wear them to keep warm during early morning runDisney events, but they can help with recovery as well. I recently picked up these black compression socks made by Renard Compression. When I first put them on I could instantly feel the pressure on my calf muscles. My legs instantly felt relaxed. I believe that compression helps my legs during races so they don’t feel sore when I am finished. I also like to wear them after a long run while I am relaxing. I’ve noticed that by doing this while increasing my milage each week, my legs don’t get sore anymore. I also believe that these new socks are contributing to that. These socks are some of the most cushioned socks that I have ever had. I could instantly feel the comfort when I put my foot in. Comfort is something that I look for in a sock because I don’t usually like anything on my feet. Renard has done a great job with the quality of this product. I feel that the socks will last a long time through the wear and tear of my long runs and the washing machine. Overall I am very happy with this product and I can’t wait to run in the socks some more in the future. If you would like to read more about them you can find them on Amazon here. I received this product at a discount for giving my honest,.unbiased review. I woke up the morning of the 10k feeling rested and ready to race! The good thing about getting up early and running the 5k the day before is that I was tired enough to fall asleep that night despite all of my excitement. The 10k started thirty minutes earlier, so that meant I had to get up earlier. Every night before bed I made sure that I had everything that I would need laid out and ready to go, including my costume. About thirty minutes after I woke up we were heading out the door. This race I was dressed as Princess Leia. I had found the perfect Leia dress at JcPenney that looked like it was made for running. The material felt great and it even had netting on the back in case I got too hot. The only problem was that it had a hood attached for the hair and a tight collar around the neck. My mom was able to remove the hood and collar and re-sew a neckline to create a perfect running costume! I was really feeling the nerves by the time we got there. I planned this race as my goal race. I figured that it would be the easiest to go my fastest which would get me a great proof of time for future races. I really wanted to finish in less than fifty minutes, but I would be happy with just beating last year’s time of 51:25. It was a cool morning so when it was time to enter the corrals I removed my jacket, but left the white matching arm warmers on. Once again I headed to the front of corral A. Time seemed to speed by and before I knew it we were once again walking towards the start line. The announcers talked for a bit and then at about 5:30 the fireworks went off and I sprinted over the starting line and out onto the course. This course was the exact same as last year, right down to the entertainment. That didn’t bother me, but I thought they could of at least had Ariel and Prince Eric on top of the first overpass instead of Anna and Elsa since the theme was The Little Mermaid this year. After the overpass we made our way through the Epcot parking booths where a speaker warned the approaching runners of the speed bumps. I don’t remember that happening last year, but it sure was nice. One of the hardest parts of the course came at about a mile after we turned the corner and headed back towards the park. There was an overpass we had to run up, but it wasn’t as bad as I had remembered from the year before. My hill training really paid off on those inclines! The first mile took me 7:36 according to my Garmin. I was very happy with that because that was about the time of my first mile the year before. The problem I had that year was that I really slowed down after mile one, especially in the second half. This year I wanted to try and maintain my pace the best that I could. Mile two was 8:02 with the incline which wasn’t bad at all. I allowed my self to slow down a bit for mile three. I planned on really picking the pace back up for the second half. Mile three took me 8:10 and then we finally entered the World Showcase. I tried not to look at my Garmin too often and went by feel. If I felt that I could speed up then I did. When I wanted to look at my watch to see how far to the next mile it was almost impossible because of how dark it was even in the passing lamp lights. I could have hit the back-light button, but I was afraid that I would accidentally mess up my track. I did end up picking up my pace during mile four at an 8:04 average, which could be because of my excitement of running through the different countries and onto the Boardwalk. The Boardwalk didn’t seem as difficult this year either. Last year I was afraid I would trip on one of the boards, but this year it didn’t seem to make a difference. It was one of my favorite parts because I was almost finished and the guests from the Boardwalk Hotel were out there cheering us on. Mile five around the Boardwalk took me 8:12. Like most races, the last mile was the toughest. Mile six brought us through a backstage area and back into the park. I used everything that I had in me to maintain my pace and beat my previous record. I knew by my time that I probably wouldn’t make my goal of under fifty minutes, but I also knew that I wasn’t going to give up and I would try my best. I was able to maintain my pace and finish mile six in 8:12 as well. The most welcoming sight was when I passed Spaceship Earth. That was always the symbol for the end of the race to me. I sped past it and then passed the six mile sign. Only 2/10ths left! I ran as fast as I could and looked up at the clock when the finish line was in view. All I had to see was that the clock was past the fifty minute mark and the disappointment settled in. I know that I must have had a disappointed look on my face, but I ran hard anyway. I smiled and did my fist pump over the finish line! Then it hit me, I beat last year’s time! A new PR is cause for celebration! After I got my medal and snacks, my family informed me that my tracking said my time was 50:17. They told me how great I did. I only missed it by 17 seconds! If only I had made those seconds up, but I was still proud of myself. There wasn’t too long a line at the characters so I headed over there to get pictures taken with my medal on. I was in line for Rapunzel, but by the time I got up there Aurora took her place. I took my photos and then we headed to the parking lot. On the way to the parking lot we past a medal engraving tent. I stopped to check it out and was informed that it was $20 and it would take less than two minutes to get it done. Chris paid for my medal to be engraved and I was really pleased with the outcome, that was until the results were posted by Track Shack. According to my results I finished in 50:15. I was happy to have finished two seconds faster than I thought, but now my medal had the wrong time on it. I asked the next day at information and the guy didn’t know why there was a difference and didn’t think two seconds mattered; he must not be a runner. I emailed Track Shack later and was informed that they use a different timing system for the runner tracking then the official results and that is why there is a difference. The right time is the official results, which means that my medal engraving is in fact wrong. I will have to try to get it fixed somewhere, or just live with the wrong time. I would advise that you not get your medals engraved at the finish line. It’s not their fault, but since the official results don’t come out until later in the day, there is a chance that the time they engrave will not be correct. They also don’t engrave the place on there. I will not make that mistake again. After we left Epcot, it was time for a well-earned breakfast at the Contemporary resort. I had never been in the resort before so I was extremely excited. The food at The Wave was really good (sweet potato pancakes!) and the grounds were beautiful. We were able to take a great family photo just outside by the water. After we went to pick up our free gift at Fit 2 Run at Downtown Disney, it was rest and relaxation the rest of the day for me so I would be ready to tackle my first Disney half marathon the next day!